The mod also features the 23 updated tracks used for Monster Cup schedule. 24 tracks in total since Daytona has an additional night version included. For each one of these tracks, the mod keeps the feature called ghostcar that will be explained below. You can take the ghostcar feature ON at Setup screen after loading the desired track. With this feature activated, the mod will bring "average laps" raced by the PACECAR as guide. Then... when the user beats the pacecar lap time, it becomes himself the lap to beat. So... as the user gets himself improved.... it has to beat himself more and more. 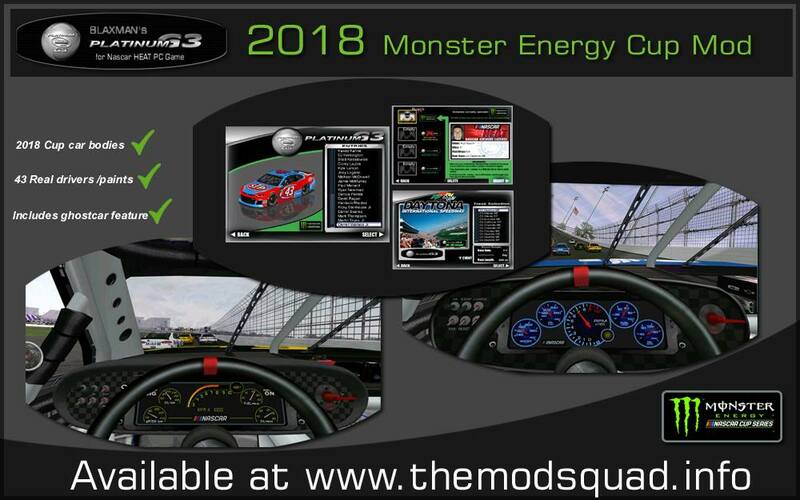 Once the user participates of online races, the best laps ever record of the races will be captured/recorded on his mod records. So, for example: Let's say "whoever" scored the BEST LAP EVER on the raced track. The user will later be able to race against "whoever's" ghostcar (as long as he wants) and try to adjust his car or skills to catch "whoever" and beat him up next time they go online. So..... it's up to the drivers now. We are trying to make it simple this time around. To avoid all those problems Windows 7, 8 or 10 use to have with Windows putting things on the wrong places or virtual folders. We are providind the mod and tracks in folders. Unzip the Mod pack, copy the CotPlatinumG3 folder and paste it into Nascar HEAT folder. New users installing the mod for the first time will only need this. No need to install base files. For the older users, who already have the 2017 (or older) mod working, they just need to confirm to overwrite the existing files. That's it. Unzip the pack, select all track files together, copy and paste them all into the Run folder (that is into Nascar HEAT folder). That's it. I wish to express my deepest appreciation to each person who helped us to build this mod and kept this project alive being by their work or moral support!!! Thanks to Wes Whitney Jr, Daniel Nace, Grumpy, DaveO, Speedyman11, Bandit, Rogue!!!! Very special thanks to Cosmin Ioanesju and Douglas Allen for giving us permission to convert and adapt their Camaro model for the mod. OK.... that said..... have fun and GOOD RACING!!!!! Thanks for the hard work everyone So, when do we get a render scene for the Camaro?